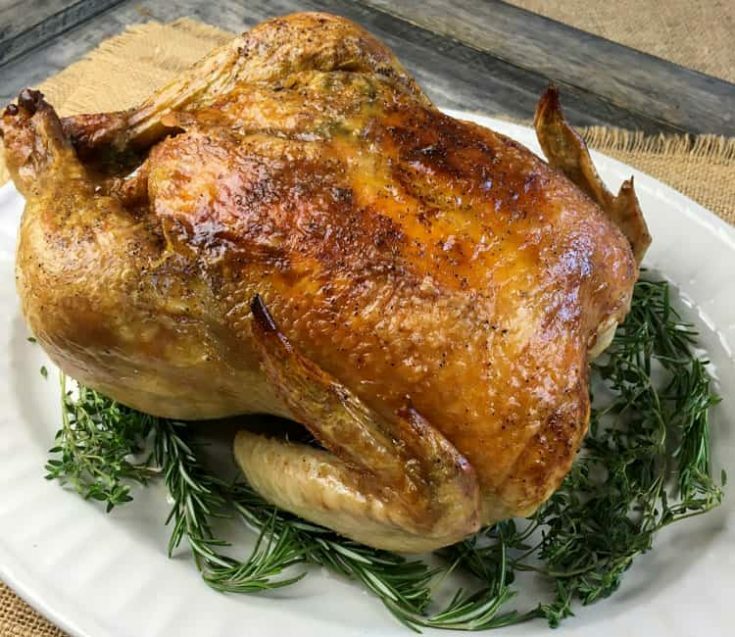 This Keto Chicken with Garlic and Herbs recipe is off-the-charts good! 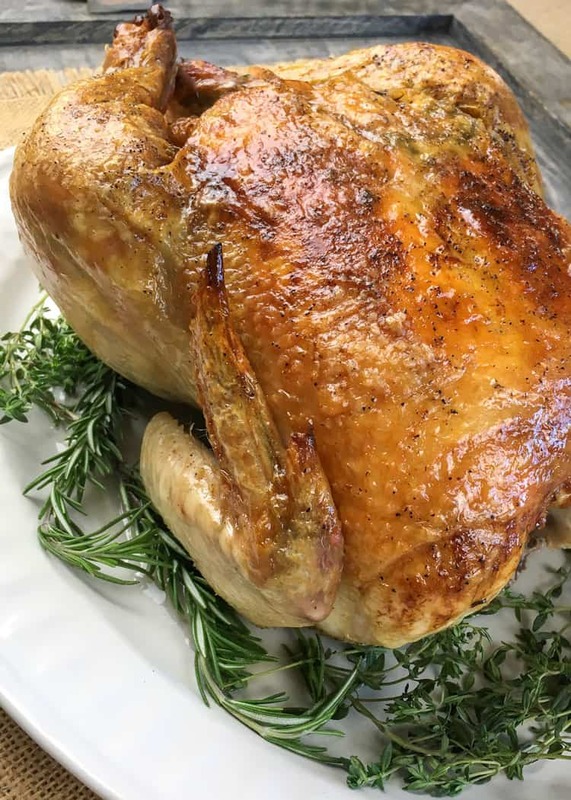 A whole roasted chicken smothered in butter (perfect for the keto diet), garlic, and poultry herbs — perfect for a Sunday dinner with family and friends or for easy weekday meal prep. Keto Chicken with Garlic and Herbs is an amazing low-carb meal full of flavor. Thanks to the preparation method, the skin is super crispy — and when you’re on the keto diet, eating the high-fat chicken skin is not just acceptable, but encouraged! One of the big keys to successfully staying on the keto diet is to use flavorful ingredients like onions, garlic, and herbs to add a bunch of flavor without adding many carbs. Sticking to well-flavored dishes can beat boredom and help you stay on the keto diet! Use Keto Chicken with Garlic and Herbs for Easy Weekday Meal Prep! When you’re on the keto diet, meal prep is key. Hidden carbs can knock you out of ketosis, so it’s best to prepare your food beforehand instead of going out for lunch and hoping for the best. While this whole keto chicken makes for a wonderful weekend family dinner, it also makes for a perfect meal prep item for a well-prepared keto dieter! Simply roast the whole chicken, let it cool, and divide it into six portions in food storage containers. Add your keto friendly side of choice (asparagus, kale, and mixed greens are all great low-carb vegetable choices) and take it to the office for a perfect keto meal! As an added bonus, you can use the leftovers to make an awesome homemade chicken stock! How Many Servings are in Keto Chicken with Garlic and Herbs? There are six servings in this recipe, so that will feed six hungry people or keep one hungry keto dieter happy for six meals! How Many Carbs are in Keto Chicken with Garlic and Herbs? This easy keto recipe is incredibly low in carbs. Each serving contains only 2 grams of carbs… 0.2 grams of which is fiber. That gives each serving a net carb count of only 1.8 grams. There are plenty of options for keto sides. Eating a keto diet certainly doesn’t have to be boring! And for a keto dessert, you could have a handful of nuts or a few pieces of stevia-sweetened chocolate. Keto Chicken with Garlic and Herbs is a flavorful, low-carb chicken dish. Preheat oven to 425° F. In the bottom of a large heavy-duty 12” skillet with high sides, arrange onion slices. Remove neck and giblets from chicken. Discard these pieces. Place the bird (breast-side up) in the skillet, on top of the onions. Using paper towels, pat the chicken dry. Generously season with salt and pepper to taste. From the herb bundle, separate approximately 1/3 of the thyme, rosemary, and sage. Remove and discard tough stems from thyme and rosemary. Combine all three herbs and roughly chop. To a small bowl, add butter, half the minced garlic, and the chopped herbs. Stir to combine. Take this herb butter and divide it into small chunks, then gently tuck it evenly under the chicken skin, covering the breast meat. Take the remaining minced garlic and massage it inside the cavity of the bird. Then take the remaining poultry herbs and stuff them inside. Using kitchen string, secure the legs together. Add the chicken broth to the skillet. Then put the skillet in a pre-heated oven. Roast for 90 minutes or until a meat thermometer inserted into the thickest part of the thigh reads 165° F. While cooking, check every 30 minutes to make sure the skin isn’t browning too much. If it is becoming too brown, cover with aluminum foil after 60 minutes and check for doneness after 15-20 additional minutes. Remove skillet from oven. Carefully transfer cooked chicken to a platter. With aluminum foil, cover loosely to keep the chicken warm. Let the chicken rest for 15-20 minutes. While the chicken rests, remove and discard the onion slices. Heat the remaining liquid in the skillet over medium-high heat. With a spatula or wooden spoon, scrape the bottom of the skillet to remove brown bits. Cook until the liquid reduces to half the volume. When it has reduced, taste and then season with salt and pepper if needed. To serve, carve chicken. Top each serving of chicken with a spoonful of the pan sauce.